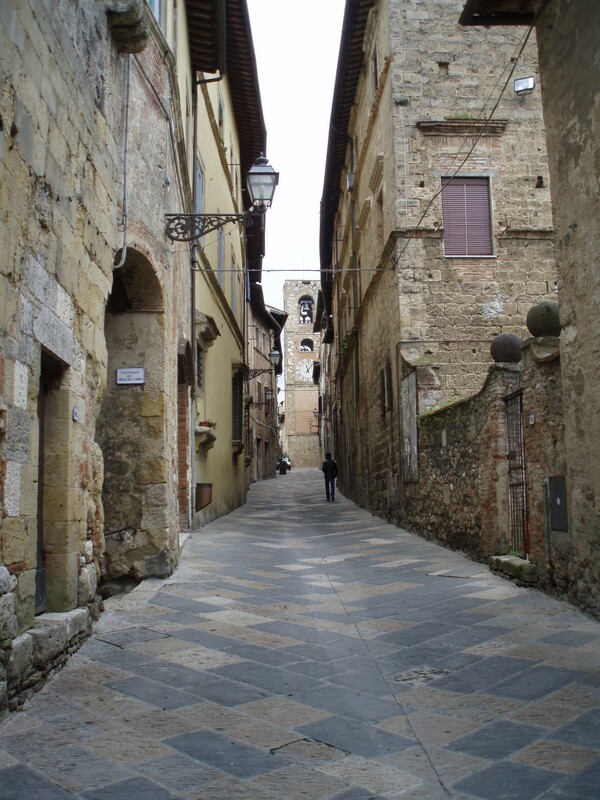 This is Vico d’Elsa, a village I’ve visited in the Chianti region. I don’t know if the people there were part of the Chianti wine and health study, but it’s a pretty place! During the holiday season, we’re drinking more. At the same time, though, we’re eating more and exercising less. Everyone’s fervent wish is that the drinking will help compensate for the other two unfortunate trends. And for the past 20 years or so, that has been the general conclusion about moderate alcohol consumption and overall health. There have been multiple small studies feeding people wine and other alcohol over short periods of time and the results have been promising to good. Of course, since demon alcohol is involved, lots of effort has also been expended trying to find the magic bullet that would bring those same health benefits without having to drink actual alcohol. So the majority of research has focused on resveratrol, a compound found in wine (more in red wine than white) and which, at least on paper, would seem to be a good candidate. I’ve thought this was a bad idea ever since I’ve been reading those studies (and I’m not the only one). This single-chemical approach neglects the hundreds, if not thousands, of other chemicals in wine. And it completely rejects the notion that some of these may act together. We know, for example, that some pesticides are even deadlier when combined with others. But studying multiple chemical interactions is a difficult prospect, not to mention that it’s less likely to bring a simple pharmaceutical solution. Then in May 2014, the Journal of the American Medical Association (JAMA) published a study examining data from a fairly large population, 783 adults age 65 and older living in two villages in the Chianti region of Italy. (Participants ranged from 65 to 82 in 1998, and were studied through 2009.) Rather than controlling their diets, the researchers looked at participants’ habits and health outcomes. They also measured breakdown products of resveratrol in urine for all subjects. And the overall conclusion was that the amount of resveratrol people consume through normal dietary means — including wine — doesn’t seem to have any impact on their health or mortality. While the JAMA study focused on resveratrol, the researchers point out that the amount of resveratrol residue in urine correlates well with the amount of alcohol the subjects reported consuming. Since this is the Chianti region of Italy, home of fabulous red wines, the assumption was that the resveratrol most likely came from wine. So it wasn’t a stretch to say that drinking more wine was not associated with better health outcomes and lower mortality rates, at least among these people. I used two wordy paragraphs explaining this not just because I’m a science geek, but because it’s important to acknowledge that this was a one-of-a-kind study. And because it created a veritable s***storm of snarky media coverage when it came out, especially in the U.S. and the U.K. I’m not sure why there was so much vitriol. Maybe some of it is the elitism thing I’ve discussed before — a little schadenfreude that those snooty wine drinkers don’t have it any better than anyone else. It doesn’t seem to have caused a stir in Italy and France, though, where people drink wine as a matter of course. 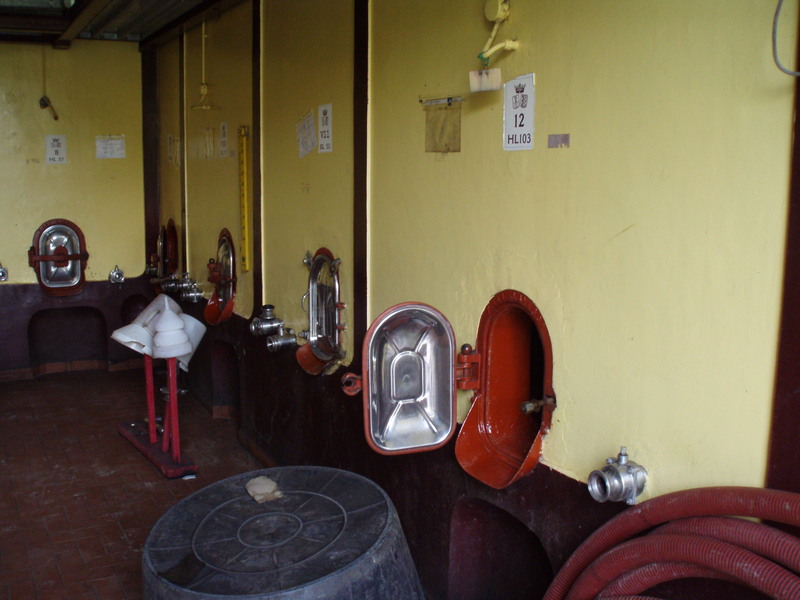 Concrete tanks containing genuine Chianti, which was probably the beverage of choice for the subjects of the JAMA study. I decided to take a look at the study more closely. And I’ve decided that while I love the methodology, I don’t think it can be used to say definitively that drinking wine has no benefit. The data are the data, and mortality and disease among the various groups by amount of alcohol consumed are what they are. My problem is with the interpretation and, more generally, with the population selected. Two things struck me right away. First, the mean alcohol consumption for those in the highest-consuming group was 31.1 grams per day. That’s the amount of alcohol you’d find in a five-ounce glass of wine. Not very much wine per day. And the second was that these “big drinkers” were also much more likely to smoke than those in the group that drank the least alcohol: 25% of the big drinkers were also smokers, while only 7.7% of the teetotalers were. A 65-year-old smoker in 1998 had probably been smoking for at least 40 years. Of course, some people can smoke for decades and live into their 90s. But if the mortality rates weren’t all that different between the drinkers and the teetotalers, maybe the wine did insulate them from some of the health effects of smoking after all, moderately consumed though it was? The biggest issue, though, didn’t occur to me until later: the study examined the elderly in two villages in the Chianti region of Italy. On the one hand, picking what was likely to be a relatively homogenous group was a plus in terms of research. You always like to eliminate as many variables as you can. But if you’ve been to villages in that part of Italy, you’ve seen that outside of the tourist zones people eat modestly and are eating the highly-praised Mediterranean diet that’s supposed to be so good for you. And they walk a fair amount, as people in farming communities are prone to do. So could you also conclude that a population already leading a relatively healthy lifestyle isn’t going to feel any particular effects from drinking wine or not? It’s certainly worth considering. Perhaps this one admittedly elegant study can’t be used to refute all those other studies that showed more positive results. It does suggest that holiday imbibing isn’t going to offer the blanket cover for gluttony we hoped it did in the past, sad as it is to think about. But think positively — maybe we’ll have a Christmas miracle! Thanks to the JAMA study I’m featuring wines from the Chianti region this week. 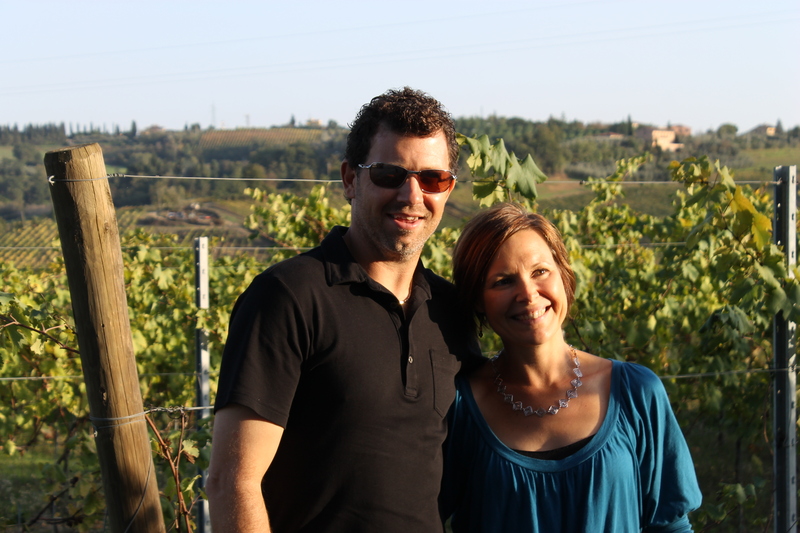 Last fall, Cy and I visited Tuscany with our friends Darrene and Chris. One of the wineries we visited was Azienda Agricola San Benedetto, located near San Gimignano. In September 2014, we got our first shipment of San Benedetto wines. The Gianelli family runs San Benedetto, producing wine and olive oil. The family has nearly a century of history growing wine grapes and olives, beginning in the 1920s. For years, family members were sharecroppers for a large farm called Casaccia, which existed until the 1960s. As the tenant farmers began to buy the land they had farmed, the Gianellis — brothers Dario and Guiseppe — bought land near the very small village of San Benedetto. They built a winery on their property in 1975. The farm, winery and agriturismo business on the property are now owned by Giovanni (Dario’s son), Marinaro (Giuseppe’s son) and Andrea and Marco Gianelli (Dario’s grandsons). San Benedetto has 25 hectares of vineyards and two of olive groves. Eighty percent of the grapes are red grapes, mostly Sangiovese with some Canaiolo, Malvasia, Colorino, and Ciliegiolo (which mostly add color to the red wine), along with a bit of Merlot, Cabernet Sauvignon, and Montepulciano. Seventy percent of the white grapes are Vernaccia di San Gimignano, and the rest are Trebbiano, Malvasia, Vermentino, and Sancolombano. The red grapes go into Chianti Tradizione ($14) and Chianti Riserva ($23), plus another everyday red and a more elegant red blend, and Vin Santo and Grappa. 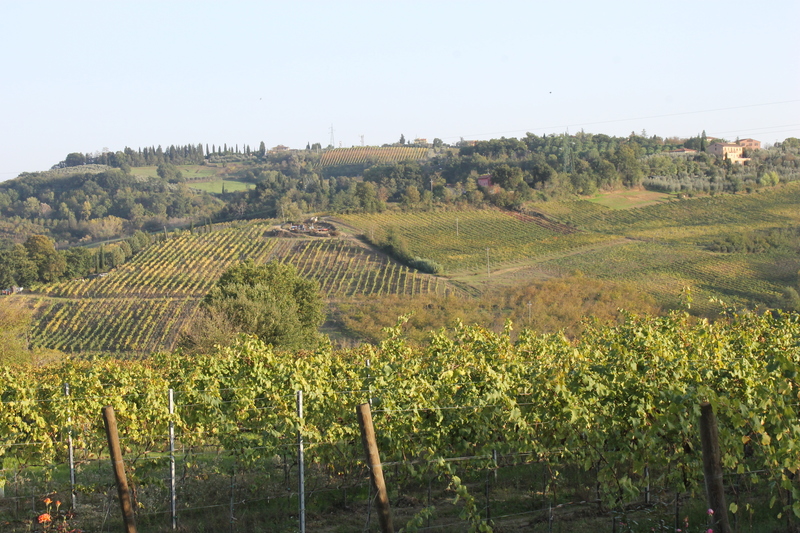 San Bendetto also produces Vernaccia di San Gimignano ($16) and Vermentino ($13) whites. It’s tough to find a single recipe that you could pair with all of these wines (nothing to stop you from making separate courses for the wines, but probably not on a weeknight). I wondered what some of these study subjects would have eaten as children back in the 1930s and 40s. So I did a little research and found several variations on a vegetable pasta sauce. While we think of Bistecca alla Fiorentina and wonderful sausages as typical Tuscan dishes, meat was consumed much more sparingly and often as a flavoring rather than a main ingredient. Slow cooking vegetables gives them a wonderful sweetness and depth of flavor, and they were inexpensive and widely available. Topping with a little cheese and toasted breadcrumbs gave sharpness and crunch. The recipe is extremely simple, the only thing you need is time to make it, between an hour and a half and two hours. Sauté finely chopped vegetables in olive oil until they’re very soft, then add a whole bottle of red wine — but in half-cup increments, like you’re making risotto. As the sauce simmers and the liquid evaporates, add another half-cup of wine. If you use a heavy, nonstick pot or skillet, this doesn’t require constant stirring, just checking it every five to 10 minutes. After the wine is all in, add some drained diced canned tomatoes and cook for another half hour. You can easily put this on the stove when you’re making dinner one night and then serve it the next or a few days later. It also freezes beautifully. Chris and Darrene at San Benedetto. Good friends, food, and wine make any trip special! The recipe makes almost three cups of sauce, which is enough for more than a pound of pasta. Since the sauce isn’t chunky, it works well with spaghetti. Take about a cup and a half of sauce (or more, if you like your pasta saucy) in a large skillet and heat it up while you’re cooking a pound of pasta. Add about a half cup of pasta cooking water to the skillet, then the drained pasta and cook for a minute to put it all together. Turn off the heat and toss it with a little grated Parmesan cheese. Serve it with more cheese or toasted breadcrumbs. There are plenty of tips on eating and drinking responsibly out there, and you’re no doubt tired of hearing about them. There are lots of tempting things to try, and some that we have only once a year. Try not to neglect getting some exercise, drink plenty of water, and eat sensibly when you’re not at a party or dinner with too much delicious temptation. We don’t know the exact extent that wine helps us combat our bad habits, but do we really need that as an excuse to drink it? Fit the food processor with a steel blade. Turn on the processor and drop the garlic cloves through the feed tube one at a time until each is finely chopped. Turn off the processor and add the onion pieces. Pulse until they’re finely chopped. Scrape the onion out and put the carrot pieces in the processor. Pulse until they’re also finely chopped. Scrape them out, then repeat with the celery. Heat the olive oil in a nonstick pot or large skillet. Add all the chopped vegetables plus the sprig of rosemary, about 1/2 teaspoon salt, and some ground black pepper. Turn the heat to very low, cover the pot or pan, and cook for 15 minutes. Take off the lid and cook for about 10 minutes more, stirring occasionally. The vegetables should be very soft and lightly browned, and their liquid should have evaporated (there will still be oil in the pan, just not vegetable liquid). Add 1/2 cup of the red wine and simmer until it’s absorbed and evaporated, about 10 minutes, stirring occasionally. If you have a flame tamer or simmer shield, this is a good time to use it. Repeat until you’ve used all the red wine. Then stir in the tomatoes and cook for another 30 minutes. Stir occasionally and check to see that it’s not burning or outrageously thick. If so, add a little water. Taste for salt and pepper. For one pound of pasta, use half the sauce — heat it in a large skillet and set the pasta to boil in a big pot of salted water. When the pasta’s nearly cooked, add half a cup of pasta water to the skillet. Then drain the pasta, reserving a little more pasta water. Stir the pasta and parsley into the skillet and cook for another minute, adding more pasta water if you need it. Turn off the heat and stir in the half cup of cheese. Pour into a heated serving bowl and drizzle with a little more olive oil. Serve with extra cheese and toasted breadcrumbs (if you like them). Toasted breadcrumbs: heat 2 tablespoons olive oil in a large skillet. Stir in 1 cup unseasoned dry breadcrumbs with a little salt and pepper. Stir for a couple of minutes until the crumbs are browner and smell a little toasty. This entry was posted in Azienda Agricola San Benedetto, Health benefits of wine, Musings/Lectures/Rants, Resveratrol, Uncategorized, wine delivery washington dc and tagged Azienda Agricola San Benedetto, buy wine online dc, Chianti Riserva, Chianti Tradizione, Health benefits of Resveratrol, health benefits of wine, resveratrol, Resveratrol in wine, Resveratrol studies, Tom Natan, Tuscan Vegetable Pasta, Vegetarian recipe, Vermentino, Vernaccia di San Gimignano, wine delivery washington dc. Bookmark the permalink.